OWHR Institute-Quebec Director, Isaac Romano (L) with noted anti-war representative of the people, U.S. Senator George McGovern (R) at a major news conference held during the five day OWHR war resister, war resistance conference held in British Columbia in July 2006. The event drew many Canadian former draft resisters and military deserters, who came to Canada during the U.S. War in Vietnam, in what was the largest U.S. outward migration, since the U.S. Revolutionary War. Many stayed to build productive, satisfying lives in Canada, made more possible with position of support for U.S. war resisters and opposition to the U.S. War in Vietnam, voiced by the Prime Minister, Pierre Elliott Trudeau and the Canadian progressive politicians of that era. Of the over 75,000 men and women war resisters who came and settled in Canada during that conflict, more than half chose to stay and build their lives in Canada, even after the Carter Presidential Pardon was offered. New York Times bestselling author Robert Fulghum is Honorary Co-Chair of the OWHR Institute-Quebec Amnesty Working Group. As a Northwest Unitarian Minister in the late 1960s and early 1970s, he counselled numerous military deserters-war resisters during the Vietnam War. Some of these U.S. war resisters made their way to Canada, to raise their children, building illustrious careers, ...including many successful journalist, media personalities and authors. One such U.S. military deserter that settled in British Columbia during the U.S. war in Vietnam, authored over 40 books and could well become a Canadian equivalent to Vincent Van Gogh, with his acumen for exceptional painting artistry. There were many such contributions to Canadian life, by that immigrant group, from the U.S. 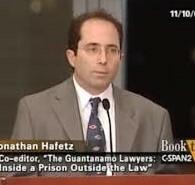 Professor Jonathan Hafetz is an expert on human rights, constitutional law, national security, and international justice issues. He joined Seton Hall University School of Law in 2010. Professor Hafetz is also an internationally recognized constitutional and human rights lawyer. Prior to joining Seton Hall University School of Law, he was a senior attorney at the American Civil Liberties Union, a litigation director at New York University’s Brennan Center for Justice, and a John J. Gibbons Fellow in Public Interest and Constitutional Law at Gibbons, P.C. He has litigated numerous cases at all level of the federal courts, including Al-Marri v. Spagone, 555 U.S. 1220 (2009), Boumediene v. Bush, 553 U.S. 723 (2008), Munaf v. Geren, 553 U.S. 674 (2008), Rasul v. Rumsfeld, 542 U.S. 466 (2004), Meshal v. Higgenbotham, 804 F.3d 417 (D.C. Cir. 2015), Salahi v. Obama, 625 F.3d 740 (D.C. Cir. 2010), and Jawad v. Obama (D.D.C. 2009). Professor Hafetz has authored or co-authored more than thirty amicus curiae briefs for the U.S. Supreme Court and federal courts of appeals. Matt Adams is Advisory Staff on the OWHR Institute-Quebec’s Amnesty" Working Group. Reverend Colin Bossen is Advisory Staff on the OWHR Institute-Quebec’s "Amnesty" Working Group. Reverend Colin Bossen is a PhD Candidate, American Studies, Harvard University, and Unitarian Universalist Minister. He is current acting Senior Minister of the First Unitarian Universalist Church of Houston. His academic work focuses on the relationship between theology and social movements. He has been involved in justice struggles for more than two decades. Reverend Colin Bossen is co-author, along with Julia Hamilton of "Resistance and Transformation: Unitarian Universalist Social Justice History." Reverend Colin Bossen, through this book provides a comprehensive process of understanding and personal reflections of Unitarian Universalist churches actions durning the U.S. war in Vietnam. The actions of U.U. church members, as part of a nationwide draft resistance movement. including its Rev. Dr. Jack Mendelsohn, minister at Arlington Street Church at that time are provided allowing further understanding of the personal decision of UU individual members, to respond and act from conscience. In 1977, President Jimmy Carter used his moral authority, with Presidential Pardon allowing those U.S. military deserters and draft resisters who were in exile in Canada and other countries of the world, to select, should they wish to return to the U.S., to resume civilian life, without threat of punitive arrest. Than you President Carter. 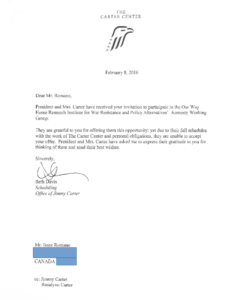 We are pleased to announce and share this letter we received from former President Jimmy Carter and First Lady, Rosalynn Carter. They wrote to us to share their appreciation of our Amnesty Working Group, Amnesty series of forums, wishing us their best wishes for our important initiative. The President and First Lady are in their later years and still active doing good work for our world and indicated their regret that their busy schedule, in these productive, later years of life, mean that they could not join us. We thank them for their support and response and send our best regards and thanks to former President, Jimmy Carter and First Lady, Rosalynn Carter. In 2020, when we will likely see the next Democratic US Administration in the White House, OWHR Institute-Quebec is planing to host a series of four, day-long sessions, bringing both US and Canadian progressive lawmakers to the Amnesty Working Group day-long series of forums. We will use the U.S. - Canada Amnesty Working Group forums to build the relationships among progressive lawmakers in the U.S. Congress and the Canadian House of Commons (and with official representatives from the White House, or perhaps see the U.S. President in attendance.). We will use these forums to lay the ground work to see the way forward to a complete Amnesty for U.S. military deserters from the Iraq war or other associated conflicts, so that these men and women of conscience are allowed, to have choice to return to civilian life in the U.S., without fear of reprisal, such as military arrest. This will allow these men and women of conscience to return to their families and friends, if they so choose, provided by either Presidential Order or by Congressional Bill, to create what U.S. historian Howard Zinn would call “a people’s history” for Americans and for Canadians.